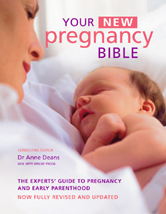 Recognised by women and their caregivers as simply the best pregnancy guide available, this latest edition of Your Pregnancy Bible has been updated to take account of recent changes in antenatal and newborn care and to provide more comprehensive discussion of caesarean deliveries. Given a fresh look design wise, it still contains special fold-out sections on each of the trimesters and the birth process; week-by-week images of the developing baby; in-depth chapters dealing with all aspects of antenatal care, labour preparation, delivery experiences and care of the newborn; comprehensive reference sections on medical treatments and procedures in both pregnancy and the postnatal period and an extensive glossary of ante- and neonatal terminology. Written by a team of eminent specialists under the direction of a leading UK obstetrician, it is filled with everything prospective parents need to know about creating the optimum environment for a developing baby and safeguarding the health and wellbeing of the mother.